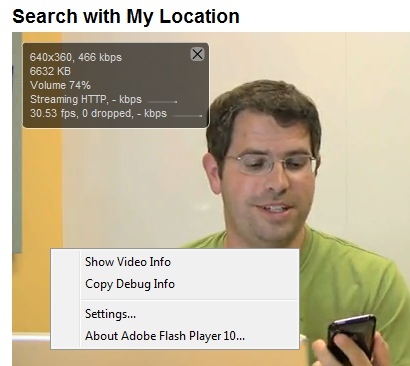 If you visit youtube.com, right-click on a YouTube video and you'll find a new option: "show video info". YouTube displays a lot of information about the current video: resolution, bitrate, frame rate, file size, the number of dropped frames, volume. There's also an option to copy information useful for debugging. In other YouTube news, Chad Hurley posts that the site serves more than one billion videos a day. "Three years after the acquisition, our platform and our business continue to grow and evolve. We are still committed to the same principles that informed the site early on, but we know things have changed. As bandwidth has increased, so has our video quality. (...) We're working hard to keep up with the fast pace of technology to bring you everything you would expect from the world's largest video site: better quality; a full spectrum of choices and tools for users, partners and advertisers; and ways to make the YouTube experience your own anywhere, anytime." Congrats on the Billion! Not give us some better TV shows. old news.... used to be called 'Show Debbuging Info' on some pages. I'm seeing this almost two weeks now; I thought it was a part of the last release note. :? too late, they should make this before. now that there's 1 billion page views they are investing more time to do something an trying to monetize the site... may we'll see ads showing up just like hulu.. or others! The "video info" feature used to work a few months ago, but recently, it just shows "0 kbps" even though video loads and plays normally. I would also like to see Youtube publish their algorithm for deciding whether and how to recompress our uploads. Dissapointed with the transcoding done by Youtube with a 1080p video I uploaded, encoded by virtualdub from a MJPEG into a XVID. Does Youtube skip transcoding for uploaded files of certain preferred formats? is there a way to get the same options while watching from mobile phones? Hey the video info keeps showing up automatically and even when I close it it just pops up after a couple of seconds. Can you disable it somehow.